If you haven't read Part 1, Part 2, Part 3, and Part 4, read them first. Just looking at the moon from the earth, it would be almost impossible to figure out what is truly happening with the moon. It appears that the moon is orbiting around the earth about once a day. However, science has proven that the moon does orbit the earth — but it is about once a month rather than once a day. The moon goes around the earth approximately one time every 29 1/2 days. The moon always shows the same side toward the earth, so we never see the side facing away from us. The moon itself does not have any light. Its light is reflected from the sun. The sun always shines on the moon and half of it is always illuminated. What we see depends on where the moon is in relation to us and the sun. When the moon is directly between earth and the sun, it is considered the new (dark) moon. During this phase, the sun shines its light on the part of the moon we can't see, so we don't see any illumination. As the moon goes further around the earth, the sun shines its light on more of the moon that we can see. When the moon moves half way around the earth, the earth is between the sun and moon. This is when the half that we see is totally illuminated, thus the full moon. I put together an image below to illustrate what is happening. This is just to illustrate the illumination, so try to ignore the fact that the proportions are incorrect. The outside moon images are there to show where the sun shines on the moon depending on where the moon is in its phase. The inside images show what we would see from the earth. This should make it clear what is actually happening. When the moon is between the sun and the earth (right moons), we see the new moon — and we see it (what little there is) only during the day. 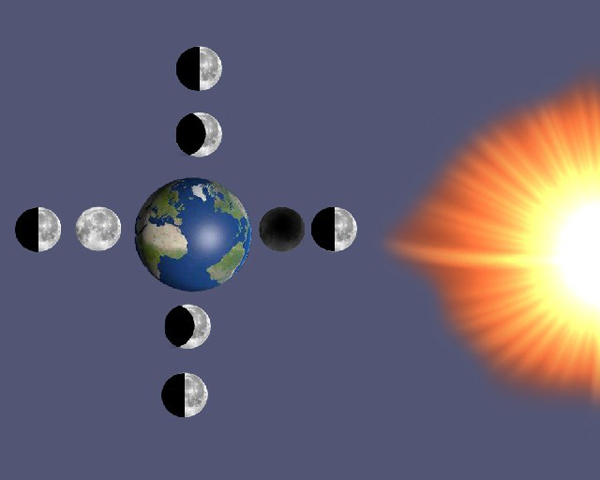 When the moon is even with the earth on the 1/2 moon waxing (top moons), the same part of the moon is illuminated, but we see the part that faces the sun. So, it makes the shape similar to a "D." As the moon continues to orbit the earth, the earth gets between the sun and the moon (left moons). That is when we have a full moon — and we see it all night long. This is because the moon is totally opposite the sun from the perspective of the earth, hidden from us during the day. It makes the "O" shape. Then, as the moon continues to orbit the earth, it gets even with the earth on the 1/2 moon waning (bottom moons). Again, the same part of the moon is illuminated, but we see the shape of a "C." On the image below, it appears to have the shape of a "D," but if you put yourself in the middle (on earth) and look at it from that perspective, it is the shape of a "C." So, as I mentioned in the last article, "D," "O," and "C" are the shapes in order of the phases. One of the confusing things to me is the terminology of the quarters. The first quarter is really the first half moon, and the third quarter is really the last half moon. It makes sense if you think about quarters being a fourth of the phase, but it is easy to try to associate quarter with amount of illumination instead of the actual phase. Another reason it is confusing is because the quarters start with zero (although you probably won't see it listed as a quarter). The first quarter starts at the half moon getting fuller (waxing) until the full moon. The second quarter starts at the full moon and the illumination gets smaller (waning) every day. The third quarter starts with the half moon waning and ends with the new moon. There is no "fourth quarter." I realize I spent a lot of time covering the phases. But I think it can be of a benefit to understand when the phases occur, and it can also help to interpret solunar calendars. Here's the part I've really been looking forward to — my ratings from my guide trips over the past few years. I have a database that keeps all the information from my guide trips. Not only do I record my customer information, but I also record trip information. After each trip, I enter the number of fish, average weight, biggest fish and a rating (0-100 percent) of how the fish were biting. The ratings are subjective, but I believe they have a good degree of accuracy because I'm there for every trip. The first chart takes the average of ratings for each trip and charts if for each moon phase. The next five charts do the same thing, only for each season. The next five charts show stats for my trips where we caught fish over 7 pounds. The first chart shows all fish in all seasons. The next four charts do the same thing, only they are broken down for each season. Interestingly, my personal stats show the full moon to be worse than average for fish over 7 pounds. I've always heard that three days before and after the full moon are the best time for big fish. My stats are actually more consistent than you would expect for fish over 7 pounds in each phase. From what I've seen, you can't rule out any phase completely. So, my advice is still to fish as much as possible on every phase. Next time, I plan to look at giant fish (10+ pounds) in my own stats as well as the top 50 fish in Texas. We'll see if there's a best phase for catching those giants. Be sure to check back often and record all your bass in the Insider BASSlog.